Caitlin Houlahan makes her Broadway debut as Dawn (the lovable, sheepish waitress who finds her soulmate online using the screen name New Dawn Rising) in the hit musical adaptation of Waitress. Fans of TV's Girls may recognize Houlahan from her appearance as surf camp hostess Amanda-Lane on the season six premiere. She also appeared as Jane Darling in Peter Pan Live! and as Carolyn in The Bridges of Madison County tour. 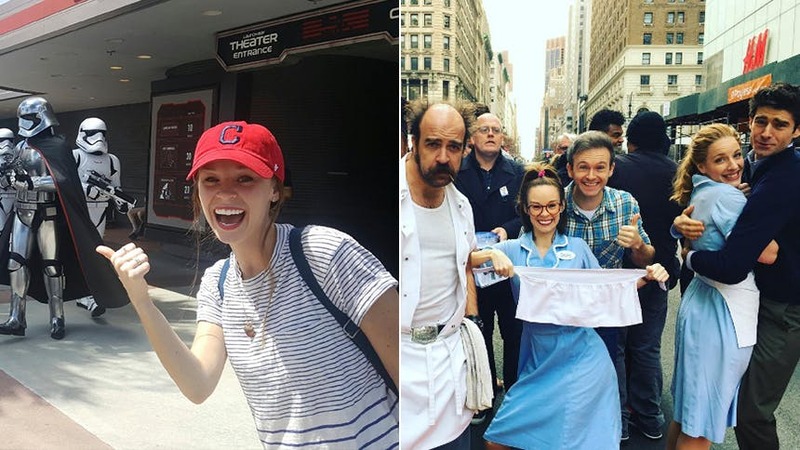 Get to know Caitlin better as she talks with BroadwayBox about joining Waitress, pre-show rituals, and her standing Monday night date with The Bachelor. My mom, of course! She had heard "I Choose You" by Sara on the radio multiple times that day, was convinced it was a sign, and was totally waiting for me to call. Chatting and giggling with Charity Angél Dawson while we put on our makeup. And then all of us gather backstage before the show and do a "pie" huddle and choose a pie of the day. And then I go into my corner and I do a few quick yoga poses/stretch and a couple final vocal warm ups. Chocolate chip pancakes or BLT. I honestly don't have one. Most bad auditions I try to forget immediately. For my own sanity. LoL. I got these awesome vintage roper Justin boots from this cool little store in Deep Ellum in Dallas that happened to be in my size (aka toddler-size feet). They may be my favorite purchase ever. agreeable (my senior year I was voted "nicest"), outgoing, empathetic. Sleeping in, making a big breakfast with a nice cup of coffee, watching Kathie Lee and Hoda, taking our dog, Moony, to the dog park, doing all the laundry, talking to my mom on the phone, ordering pizza, and then sitting down to watch The Bachelor (with candles lit). This is pretty much what happens every Monday. "She really wears her hair like Dawn!" And, "You look like you're 12." Get yourself over to Broadway's Brooks Atkinson Theatre to see Caitlin Houlahan as Dawn in 'Waitress'.